we regret the issues that occurred regarding the replacement of your floor. We never want our customers to be frustrated with their experience, and we understand that weâ€™ve been in contact with you about this issue and have reached a resolution. Please donâ€™t hesitate to contact us with any additional questions or concerns at 888-588-2315 x4195 or customersupport@empiretoday.com. We had a laminate floor installed by Empire in February of this year. The installation was incredibly shoddy, but since it took them a full day longer than estimated to complete the job we just wanted them gone so we lived with it. A few months later we notice some kind of staining in the floor that looked like mold so we asked Empire to come look at it. Four different contractors were sent to the house, each one with seemingly no background on what the previous guy had found. Finally, after the last specialist came out and wrote up a report that stated that the floor was defective due to a manufacturing flaw, the customer service rep we were dealing with disappeared and stopped returning calls. After going back to the 800 number and being shuttled around we ended up back with our original rep who sent out a salesperson to have us pick out a replacement floor. The rep showed up with three colors of floor to choose, of a quality that was inferior to the floor we had originally purchased. We picked the floor and were told Empire would get right back to us to set up an installation. Then they stopped returning calls again. Call the 800, get shuttled around some more, finally set up an installation date. The date comes and nobody shows up. Call the 800, get shuttled around again and finally speak to a different customer service rep who says there is no record of a salesperson visiting us much less an installation date. At this point we just want our money back but no one will call us back. 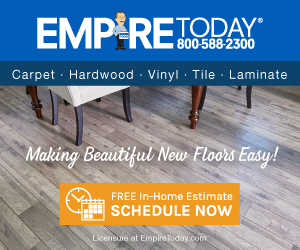 Product or Service Mentioned: Empire Today Installation. Review #302803 is a subjective opinion of cvfiore.